Cafe management software - list of saved bills. On this screen you can see created bills for chosen period. � Also you can view bills that have been printed more than once. 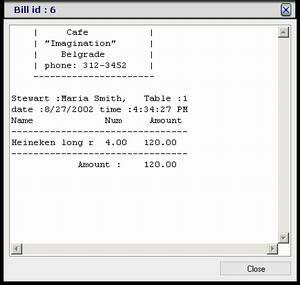 Cafe management software - design bill. Create header, body and footer of the bill as you wish. � Changes you made in the left side will manifest in the bill preview window. � Also you can select maximum length for menu item name (to print). � When you finish press 'Save' button.